With over 50,000 managed spaces, DIE DRAUSSENWERBER is the leading local provider of outdoor advertising in Berlin. However potential customers had a difficult time navigating the company's large and unique assortment of products. It also wanted to increase its reach to smaller businesses, which could especially benefit from some of its more affordable offerings. 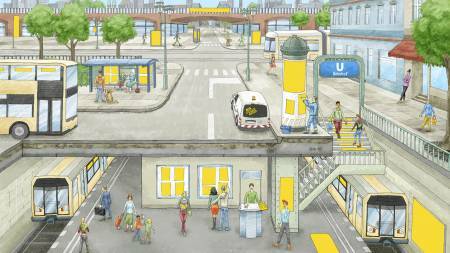 DIE DRAUSSENWERBER has spaces throughout the entire city, from overhead bridges to the underground public transportation system. This provides a unique opportunity to show all of its products in one spectacular visual landscape. 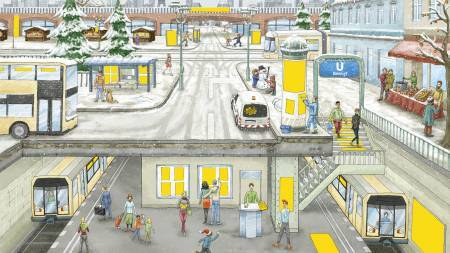 We created an illustrated poster of a typical Berlin cityscape filled with people and activity. 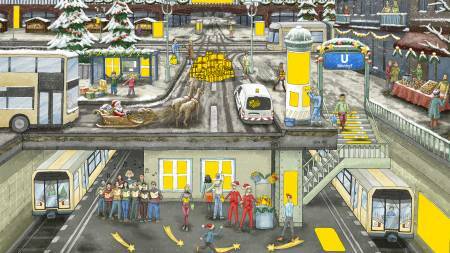 Up, down, left and right – yellow DRAUSSENWERBER spaces appear at every turn in people’s daily lives. Now in a matter of seconds, with no words needed, the viewer would understand exactly what was at the core of the DIE DRAUSSENWERBER brand and just how attractive its product spaces are. The posters became a giant hit. Since they were often hung in subway stations, they entranced waiting commuters with the characters and stories to be discovered within. To maintain public interest, we added seasonal changes to the cityscape. As a result of the poster’s high brand recognition and communicative power, the cityscape motif is now a major part of all DIE DRAUSSENWERBER printed promotion materials and used as a starting page for their website. The poster has been used in outdoor advertising in various forms for over eight years. Sorry! Some of your information isn´t quite right. Please try again. Oops! We somehow got our wires crossed. Please try again. Thank you! Your message has been sent. We will be in contact soon.